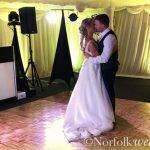 Please fill in the below form to check Norfolk Wedding DJ’s availability and receive a no-obligation quote. Enquiries are usually responded to within 48 hours. For general enquiries, please contact us. What or who is the party for? Do you have any other comments or requirements? Thank you so much Neil for making it a fantastic evening! And keeping everyone dancing until the end. The evening wouldn’t have been the same without you! Perfect music for a perfect evening.